We've sung praises of New York's phenomenal Chimichurri Grill before. Whether you seek irresistible steak, a delicious all-around menu, the warmest hospitality, or Argentine cuisine in particular... Chimichurri is where you need to be. Last month they opened a new Upper East Side location on 61st Street between Park and Lexington Avenues. 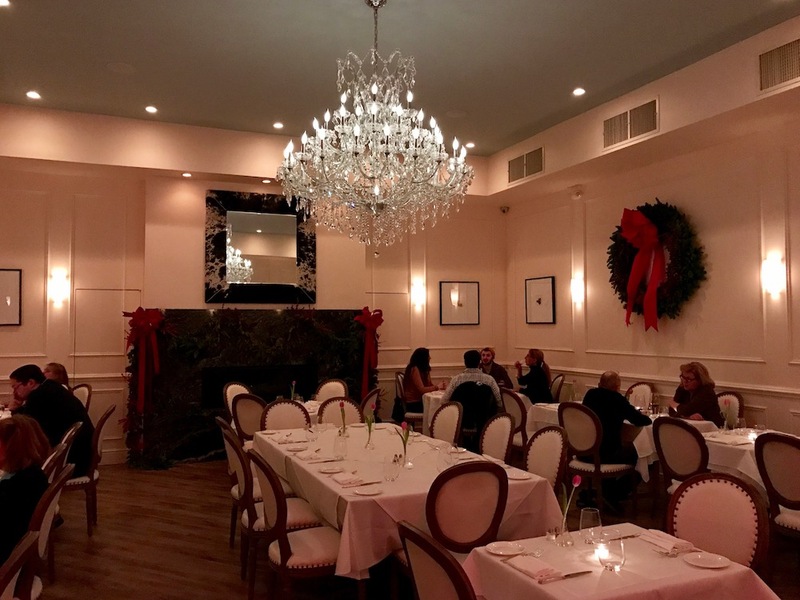 Same great menu as the original at 43rd and 9th, same warmly candlelit ambiance, but with much more space and a toasty fireplace! It's so tastefully decorated for Christmas right now that you really should try to visit this week. Last week I literally boarded a plane in Washington to go have dinner here, and flew back late the same night. What can I say to add to that? Chef Carlos repeats his time tested menu on the Upper East Side, so I still recommend the empanadas and grilled oysters (the best you'll ever have) to start, Vacio a la Gaucho (hangar steak, so elegantly prepared) as a main course, and either the Panqueque de Manzana or Panqueques de Dulce de Luche for dessert... but there is nothing on this menu that will not impress you. Pair the appetizer with a sparkling wine, the steak with a deep red Tempranillo, Malbec, or Cab, and the dessert with the sparkling Torrontes they have on offer. I was, at first, worried that the larger space at Chimichurri East would be less charmingly intimate than the much smaller Chimichurri West. These fears were misplaced, as Owner and GM Alicia has really outdone herself with the elegant decor, chandelier complimented by soft candlelight, and warming fireplace. The wall molding is all custom, with doors that blend into it, Oval Office style. There were, on December 11, several large yet simple Christmas wreaths hanging from the wall. A multi-room layout is unique in the new location on 61st Street. One steps down into a roomy bar area on first entering before walking back through a cozy space that is part anteroom, part lounge (great for a glass of bubbles before dinner), and part small dining room. The main dining room is in the back, replete with the elegant molding, chandelier, and fireplace I mentioned earlier. When I wrote in June, I closed saying that "attention to detail and pride in their work are most evident". This could not be more true than what we've seen in Alicia, Carlos, and the crew opening their new location. In the second act they've managed to replicate everything that makes the original so special, while giving their new location a unique flare all its own. I love it, and will return often... if I can ever decide which one to go to on any given occassion!